Recently, we received the J-Stars Victory Vs. Booklet, and while looking through it, we discovered some interesting news. 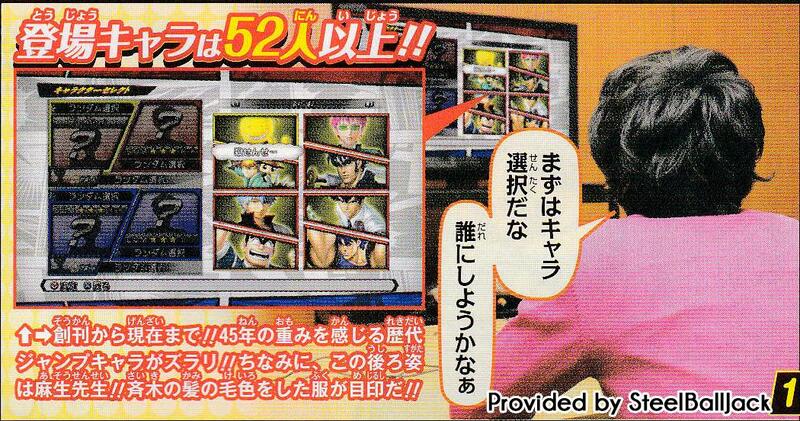 According to what we translated from the scan it says that there will be OVER 52 characters in the final roster. We had our doubts, but after sending the scan to Griffin & Tilak from gamefaqs, and SteelBallJack they all said the same thing “More than 52 characters”. So what does this mean? Well, we would like to think it means a few more characters are coming up soon or that it may be counting the non playable NPC characters you meet playing the story mode. Any chance for Kinnikuman to appear is both exciting and mostly painful. I would love to hear what he would say to the other characters. That said although it would be weird to lump the story mode NPCs along with playable and support characters, I wouldn’t be surprised if thats what they mean by ‘more than 52’. They probably just mean story characters. Who knows. Yea i think so as well, dont want to get too excited and then be sad lol. One Piece is my favorite as well. I like it more than Naruto but hmm the ??? that might be the way to transport to another world OR to get to the secret character who knows. IF there’s any. Menus will be done really fast. Story might take 1-3 weeks depends how long it is. Thanks for spreading out our website!! And I dunno, man. One Piece has 4 characters already so no. Nope, I want new series represented. Day one DLC is my bet. What other type of DLC is there? if they say there are more then 52 characters on the same page as it shows the character select I think it means there are going to be more playable/support characters! More than 52, huh? Well, if we’re getting dlc I hope they give us the guys from series who aren’t in at all before others from already represented ones. C’mon Shaman King, Yu-Gi-Oh, Black Cat, Busou Renkin and Kinnikuman. *chants* Yoh Asakura! Yoh Asakura! I still think that “more than 52 characters” means thopse that became npc, like Saori Kido, Botan, etc. It´s not the first game promo to do that….. But, We are always allowed to dream eh? Can anyone confirm whether “More than 52 characters” refers to playable/support or npcs? I think they were including the NPC’s in that number. I’ve been playing the game and I got the guide. Didn’t see any secret characters.